As you've probably spotted, when I take a photo of a finish I tend to concentrate on the light and whether the colours are true to life. However I have noticed alot of blogs where people take lovely "staged" photos of their finishes, with little accessories and settings. So here's my attempt. 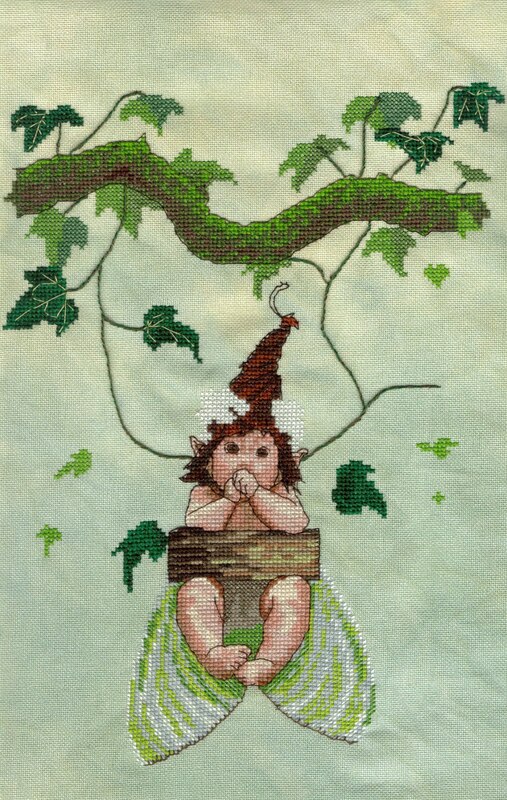 The cards are the free gift with this months World of Cross Stitching (WOCS 179). They are three flowers from The Country Diary of an Edwardian Lady or possibly The Edwardian Diary of a Country Lady or the Lady's Diary of an Edwardian Country, some such thing anyway. Do you like my rock man? I bought two from a cheap shop (QD) and hid them in the rockery when it was covered in weeds. It took the large boy a while to spot them and he was quite surprised! They are more visible now I can weed again. This is the cutest plant ever, it's just for my follower Mouse, the plant is called "Tiny Mice" because the little flowers look just like little tiny mice with 2 big ears and a long nose. The large boy saw it on the market and said we had to buy one. ﻿Charlie asked where I got my Baby Swing chart from. I actually bought it from an online shop Violarium which is based in Finland. When it arrived with several free charts I discovered there is an official Nimue site which also sells the charts. So you can get them from either source. I have yet to discover a UK based stockist but EUR3 for postage is very reasonable and you get freebie charts too! Violarium also has a blog and are currently offering free postage for the remaining day of June. Anne said she wasn't sure what a Round Robin is. Basically a group of stitchers get together and each one chooses a theme (mine is Rainbow). Each stitcher starts work on her own piece then sends it to the next in line who stitches a part of it, she then sends it on to the next until eventually it arrives back at the first stitcher completed (hopefully!). There are 6 of us in the group so there will be 6 pieces going round the world and I should get mine back next Spring! The WorldwideRR Yuku board is a great place to learn more about them and drool over other people's work. Glad you all liked the "fiddlefarting"! I don't swear (it's a sign of a dull mind) but do love emotive language! Dialect words are great fun too, one local favourite is "squit" as in "thass a loada ole squit" ie "it is alot of nonsense". I also like the way we reverse words in sentences - when waiting in a queue and letting someone go ahead "Come on, get you served". Here's my piece for the RR I've just joined. My first ever RR! I decided on The Rainbow as my theme, each person will stitch one colour. As there are six of us I'll stitch two bands. I started with Green in the middle so the next person gets a choice of colour and so on. I've chosen my bands from a sampler in a book by Brenda Keyes. It is based on a 17th Century design but I've totally changed the colours to fit my scheme. The first band is cross stitches in 3 shades of green. The next band is Rice Stitch with bottom stitch in green and the top in green metallic (703 which I used on Baby Swing!). The 3rd band is blackwork with some Algerian Eyes in a tweed of blue/green and dark green. Originally I'd planned in using a variegated thread but didn't have one I liked so tweeded instead. I actually prefer the tweeded effect alot of the time (and it's easier!). I have also kept up my resolution to stitch every cover kit for the two magazines I get. 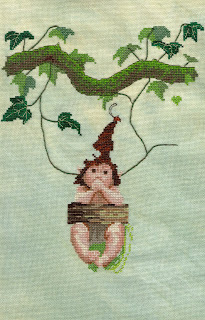 This week was Cross Stitcher magazine's turn. As a member of EWBA (Enough With the Buttons Already!) I was not going to be fiddlefarting around with tiny little buttons covered in the hardest aida I have seen, it was like perforated paper! So I used the aida to stitch the flowers directly onto the felt shapes then pinned them to this lovely tote bag I won in a FB giveaway. I did use the buttons, I coloured in some scraps of fabric in tones which matched the bag then covered with tiny buttons with them and sewed them on the bag. I have to give a shoutout to Rossiter Designs who sent me the bag via their FB page. If you're on FB then type Rossiter Designs in the search box and up they pop! I like their cute Russian Dolls designs best. First things first - Bev has moved her Wee Stitchy Blog to Wordpress. I can't say I blame her, it's been over a month now and Blogger still isn't right plus there is Radio Silence from the officials. Anyway she's having a giveaway to welcome people to her new home here. There's one more leaf to go in at the end of that liana on the right and the flowers need some long-stitch on top of the cross stitches. 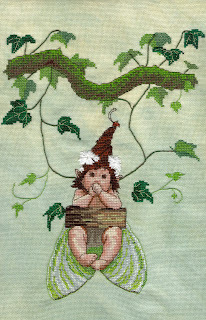 Then I have some metallic backstitch to do in apple green (or the closest I have in my stash). And finally the swing ropes. These are tricky! You take 4 strands of 2 different colours, come up at one point then a long straight stitch down another, then you fix them using a "surget point" in a 3rd colour. At the rope ends you cut all 6 strands off on the front of the fabric to make a frayed rope end. The instructions are half in English and half in French so you have to read very carefully and look at the picture ALOT. The symbols are quite confusing too, there are a set of symbols for DMC in 2 strands and a different set for DMC in 1 strand. However the wings are stitched in 2 strands but half stitches and sometimes the symbol is found in the 2 strand section and sometimes in the 1 strand. The half stitches are clever, the left hand wing they go \\\\ and the right hand wing they go //// which is a lovely effect. I also substituted the flesh tones, they suggest 3825 and 3856 which frankly are orange. I subbed 758 and 950 which usually go with 3064 and 951 on most other skins I've stitched. The designer was very helpful when I emailed her to ask what colour the metallic No 25 is, so when I've finished stitching I'll email her a pic with my comments. And hope she's not offended!! It really is the most beautiful stitched piece and I know my friend will love it. My only problem is - she has two other children! I'm teaching her to stitch so she can make them something too. Thanks for the comments on my previous post, it's so nice to know other people are extroverts who need to be alone sometimes! I learned about this on a course I took, the tutor was explaining people are not simply introvert or extrovert. Some introverts get depressed if they are alone too much and actually need people around them to thrive. Not all extroverts are the "life and soul of the party" type, you won't find me dancing on the tables or doing karaoke. But I had to speak in the school assembly yesterday to 250 children (and a dozen teachers) and I was nervous beforehand. We'd organised a competition to find which was the greenest class in their method of travel to school (eg walk or bike or scooter). The reaction when I announced the competition winners was worth it though! The winning class were so excited even before I told them what they'd won. They got a certificate each, a sticker, a pencil and an extra playtime - you'd think I'd sent them to Disneyland from the excitement! It's International Hermit and Stitch weekend this weekend so of course I'm out on a meal tonight! It's Father's Day tomorrow so not sure how much I'll get done - have to make sure the boys spoil their Daddy. 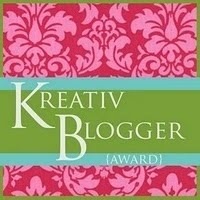 I have been awarded this lovely award by Lesley Home is Where My Heart Is Thank you Lesley! Now I have to award the award on and say a few random facts about myself. I would like to keep you guessing as to my award winners. There are two sites that really take my breath away, literally on many occasions. This is the first one here and here are your clues - it's not a single stitcher but a group. 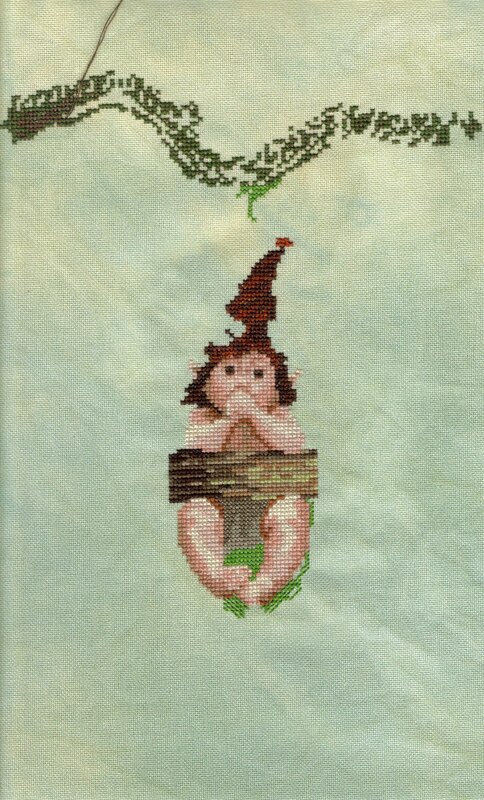 Some designs are easy for a stitcher to make look good, the Joan Elliot Oriental booklet is a good example. 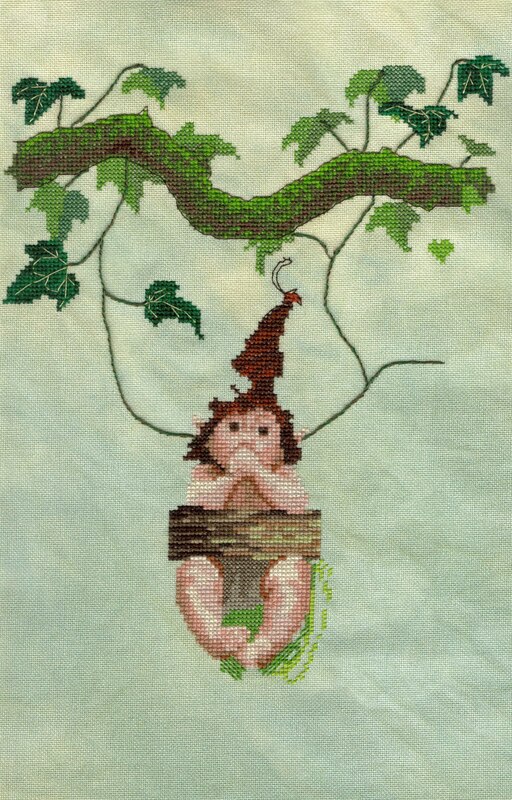 The designs are simple to stitch but very beautiful, it's almost embarassing when people admire them because Joan has done all the work and I've just stitched it! However on this site the designer IS a genius and her work is amazing BUT the individual stitchers have so much input into the finished pieces they really deserve the praise as well. See if you can guess which site it is before clicking! My second choice is here again it's not a single stitcher, in fact I don't even know if this person stitches herself. However her artistic talent is definitely not in any doubt. If "I want to live near X" was a valid reason for getting a Green Card to the States I'd be there at Immigration tomorrrow! As it is I just have to visit this site and drool all over the keyboard. If I could have a superpower it would be the ability to live one day a week as a different person, to get inside their mind and understand their motivation for the things they do. Hope you've all learned something new about me! And I have noticed I have 50 followers! Wow, I try to follow all my followers, so if you follow me and I don't follow you yet it's because I can't find your blog - leave a comment and I'll come stalk follow you. There are no photos in this post yet - disaster! It's too late to scan Baby Swing now so I'll do it tomorrow. You were all right, The Gift of Stitching Magazine is brilliant! I signed up yesterday and within 30 seconds it appeared in my inbox to download. Three issues for $3 or £1.94 - amazing. This issue has a free Ink Circles design which I love, it's on the front cover of the mag if you want a sneak look. 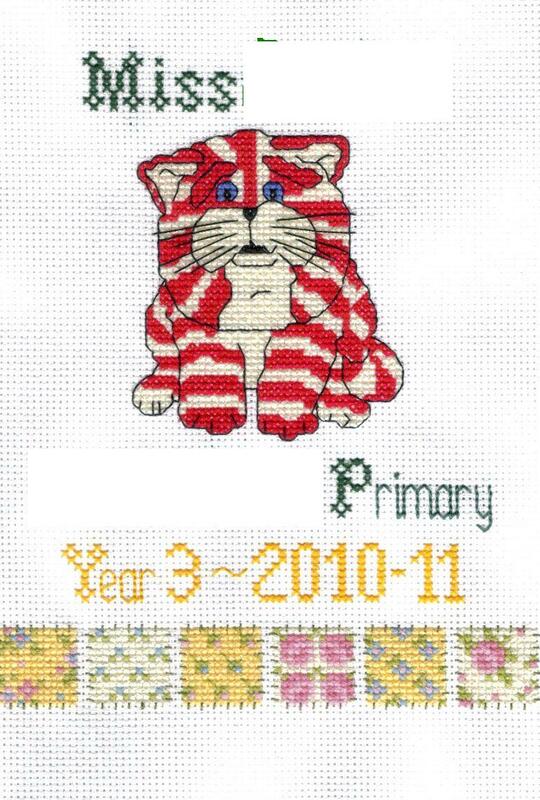 There are several other free designs inside, mostly smalls or instalment parts of larger designs. Which causes me a problem because now I want to buy all the back issues! The articles are interesting too, there's even one on ORTs but sadly no mention of the TUSAL! If anyone is thinking of signing up I'd heartily recommend it, and please add Joanne P as your Tell-a-friend so I get an extra month free! Other good news - thanks to a FB friend I have found a copy of the missing Cross Stitch Collection magazine. I was sure I had bought all 6 of the JE Flower Fairy issues but just couldn't find the first one (Daffodil 193) anywhere. 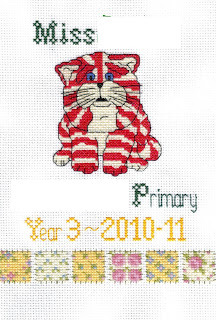 This friend pointed me in the direction of an EBay Buy It Now offer, the same seller also had a copy of Just Cross Stitch Christmas Ornaments 2010 so to save 50p on postage I had to get both! Just Cross Stitch is impossible to find round here. I used to be able to get American mags in the city but out here in rural-land it just doesn't happen. 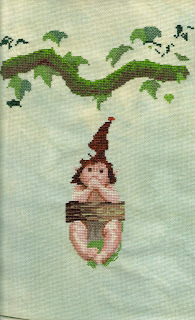 Here is the latest Baby Swing - she's looking good with some backstitch. The green lianas were tricky but look great. They are a sort of twisted back-stitch, two squares forward, one square back in blended brown and green. The stitch names are in French so I need to find a translation! They don't really follow the squares so it was more like free-style embroidery than anything else. My criticism of this chart is that the square grid is very faint so it's quite hard to count especially for some of the farflung leaves. However as it's an organic picture rather than a geometric I don't think it matters if some of my leaves are slightly differently placed.